Zebra striping is always my easy "go-to" manicure. It's a simple design to apply with some patience and a toothpick. I recently got this amazing blue color and I wanted to use it, but I was too lazy to think of some huge creative thing to do. 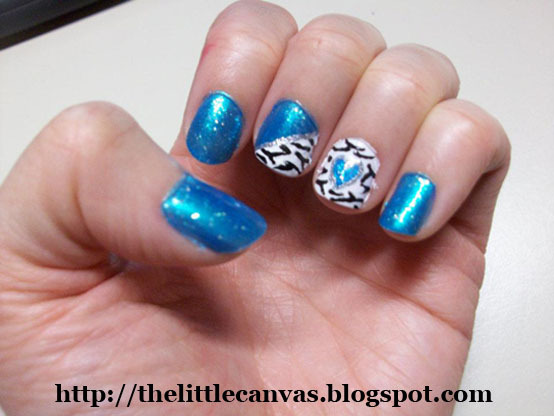 So, I came up with this, what I call my blue, zebra, heart manicure. This was one of those manicures where I could NOT stop looking at my nails. I am now beyond obsessed with the blue color and can't wait to use it again! Love it! It is like the Zoya Maisie! My pic was hard to catch the green flecks though.